Amitabh Bachchan paid tribute to poet father Harivansh Rai Bachchan on his 107th anniversary today, calling him a unique genius. The 72-year-old actor took to his blog to share about his father's literary journey. 'A unique genius... A man of immense letters, words, thoughts and several unknown deeds. Born and brought up in extreme poverty... earning his living with Rs 20 per month, and then creating some of the most extraordinary writings in literary India. 'Hundreds and hundreds of poems, around 70+ books, in Hindi, yet taught English Literature at the Allahabad University. Served in the All India Radio, and then in the Ministry of External Affairs as Officer on Special duty, nominated member to the Rajya Sabha, the Upper House or House of Lords in British Parliament,' Bachchan posted on the blog. to him by his admirers. 'A prolific writer of letters. If you wrote to him he would reply personally to each, a postcard with a line of response no matter who and where, about hundred cards each day and then walking across to the nearest post box to post them himself,' he recalled. Bachchan called him a man of immense will power, humility and simple tastes. The star said his father was a disciplinarian. 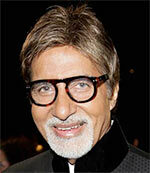 Bachchan revealed that Harivansh Rai always believed the actor was his father's incarnation, in some strange way. 'When I was in my mother's womb, and not due for a while, he had a dream one night, where his father came and told him to get up and tend to my Mother for she was in delivery, and that a son was to be born, he got up in a start and found my Mother's side of the bed empty -- she having gone to the wash room, with extreme labor pain. Within hours I was born,' he wrote. 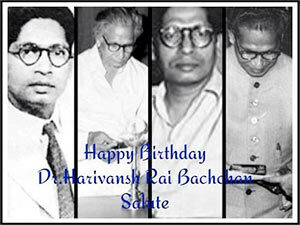 Harivansh Rai died on January 18, 2003, at the age of 96. Quiz Time: In which film did Dimple play Salman Khan's mother?